A police spokesperson said 25 people were arrested and a total of 50 charges were laid. Hamilton police laid dozens of charges Thursday after raiding and seizing all four Georgia Peach marijuana dispensary locations. Local officers, along with other members of the provincial enforcement team set to target illegal cannabis operations, executed search warrants simultaneously at the shops scattered across the city Thursday afternoon. Investigators also locked up the different locations and will be using surveillance techniques to make sure they stay that way, said Hamilton police deputy chief Dan Kinsella. "That involves alarming the premises and putting up the appropriate signage to let everybody know Hamilton police are now in possession of the premises," he explained. "The doors are locked and barred." Kinsella said police choose which dispensaries to raid based on a number of factors, including community complaints and intelligence information. However, there wasn't a specific reason the Georgia Peach locations on George, Dundurn, and Upper James Streets were targeted this time. 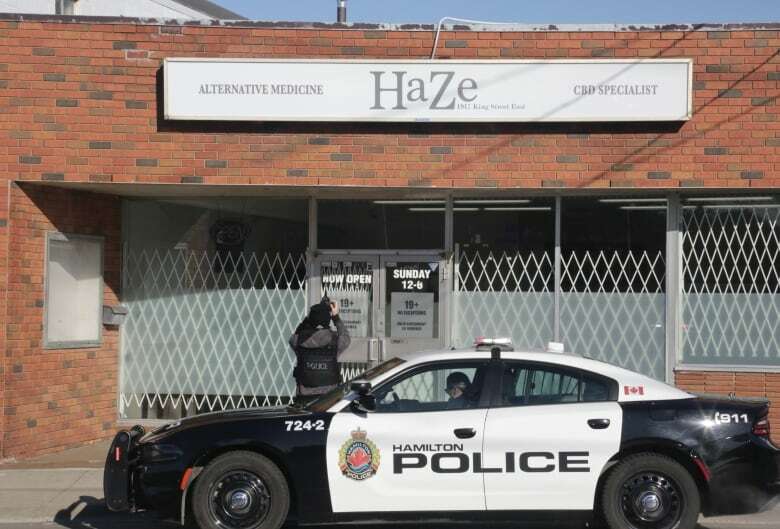 The raids come after police executed a search warrant at HaZe dispensary on King Street East earlier this month. That operation was the first time officials in Hamilton had shut down an illegal pot shop by locking the doors and installing an alarm to stop it from reopening. Since then, Kinsella said eight dispensaries have closed their doors on their own, something he takes as a sign that property owners are starting to pay attention. "That's encouraging to us. I think the message is getting out there." Counting the Georgia Peach locations, HaZe and Dank Dispensary on Upper Sherman Avenue, which was shuttered after a break-in on Jan. 16, Kinsella said six illegal pot shops have been shut down and locked up — and police plan to follow the same model moving forward. In the past, how soon dispensaries would reopen after a bust was based on court charges and a shop's ability to resupply. In some cases that meant the doors were open the day after a police visit. Now Kinsella said police are still calling on the courts to back up the force with stronger punishments. "Until the courts deliver sentences to the individuals involved that make it prohibitive for them to participate in the illegal cannabis industry, we're not going to see any change." He also has a message for property owners whose locations are still housing illegal dispensaries. "If they're not going to close them down, then Hamilton police are going to come and close it for them."